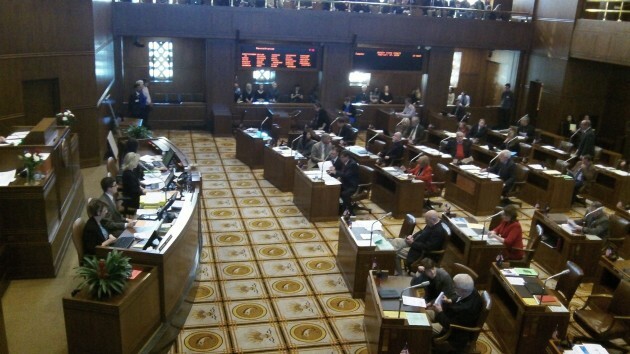 The Oregon Senate before Tuesday’s vote on low carbon fuel. Democrats in the state Senate on Tuesday rammed through a program to make fuel more expensive and less useful. You’d think that they would have more regard for the people of this state. Instead, they showed they are looking out for the fat cats who speculate and invest in alternative fuels. The vote to extend the so-called low-carbon fuels program was 17 Democrats in favor and 12 Republicans and the lone sensible Democrat in the Senate, Betsy Johnson of Scapoose, against. The bill would require reducing the carbon content of fuel 10 percent below the level of 2010 by the year 2025. With 10 percent less carbon, mileage in most vehicles likely will go down 10 percent, so the result in terms of emissions is exactly zero even while people have to pay more. Oregonians burn about 1.5 billion gallons of fuel per year. The estimated added expense amounts to $90 million to $285 million. This cash will flow to alternative energy investors and brokers of carbon credits, not into the highway fund, so it won’t do Oregon drivers a bit of good. Why would otherwise sane politicians vote for something as stupid as this? Because they are in the thrall of the climate lobby. But the program has nothing to do with saving the Earth. Oregon contributes roughly one-tenth of 1 percent of global carbon emissions, and transportation accounts for only one-third of that. So even if carbon in the atmosphere actually changed the world’s climate for the worse, Oregon’s action would have zero effect on preventing that change. Wow, you’re good. You were able to work the words “Democrats” and “will have better sense”. Into the same sentence. Well done. Sadly I don’t think there’s much of a chance, but hope springs eternal. Another Democrat solution in search of a problem. No wonder politicians, as a group, are so reviled. Congratulations, voters of Oregon…….more self inflicted “pain” from the party that says they care about the people. What a crock. Curiously, biofuel production has a very large carbon footprint. If you were interested in stopping this AND saving the planet? Then you could write about the Midwest farmers and their congress critters. I wonder what party they would be from? Anyway the earth will endure. We might not. When doing these “carbon calculations”, how many people factor in the “carbon cost” (footprint) of production of the commodity (alcohol from corn or cooking oil) that supposedly contributes to reducing “our” carbon footprint? Recycling is something we can all agree on. This is different. Are the benefits of “biofuel” being blown out of proportion for political reasons? Certainly not on the surface. However, when we go out of our way to promote something that dilutes efficiency, we must ask: Are we helping ourselves? That’s the question I’ve been pondering for many years, having come of age in the 70’s with the “ecology movement.” It IS the NET RESULT that needs to be measured, within the totality of the situation. The result is often NEGATIVE, and ignored by the LEFT because the argument “sounds good” (politically correct…GOD I hate that concept….) and contrary to their ‘wished for’ outcome despite logic that suggests (at the least) otherwise. Again, for the thousandth time from me, the ends don’t necessarily justify the means. It all depends on what is at stake, and what each of us is willing to sacrifice, OR FIGHT FOR. There are more than enough that won’t stand up to save their own skin. Thankfully, I think there are many more that WILL STAND and speak out for their beliefs…..eventually. NOW would be a good time. In the 60’s we went from no man in space to man walks on the moon. Do you think we could do that today in less than ten years? Not a chance in hell………….What have we become? “You’ve got to stand for something, or you’re going to fall for anything” ~ John Mellencamp. You got that one right, John. According to this article, “pollution” emitted by Oregon drivers is totally insignificant. The Democrat-controlled Senate and the Democrat-controlled House will pass this boondoggle that will be signed into law by a Democrat Governor – all with extreme Republican opposition. All this while our new Governor proclaims her first order of business is to “restore public trust” in the political system. Hah! Actions still speak louder than words and their actions say they cannot be trusted. Not now, not ever! Welcome to the real world of polarized politics. Simply because *neither* side will compromise — it’s become the status quo. And “centrist” folks get excoriated on both sides of the aisle.